Christ predicted His return to this earth over two-thousand years ago. Along with that prediction, He spoke of a time when He would return to rule the earth for 1,000 years. The prediction of the 1,000 year or millennial reign of Christ is most explicitly found in the book of Revelation chapter 20 verses 1 through 3. The question that faces interpreters of these predictions is: When and what is the millennial reign of Christ and how does it fit in with His return for His people? 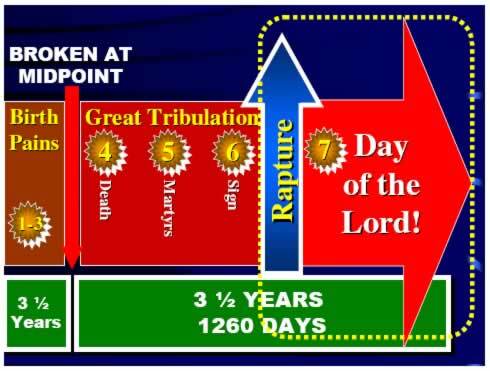 The Millennium is the starting point for understanding end-time prophecy. Many people will claim to have a certain "millennial" position such as pre-millennial or post-millennial. These descriptions explain the relation between Christ's return to earth and the millennial reign as predicted in scripture. Session 1 ended with the explanation of how the three views of the millennium reflect our understanding of interpreting scripture. One can approach scripture from an allegorical viewpoint, or a literal - face-value approach. This study takes a literal or face-value approach to interpretation. There are five keys to a face-value hermeneutic or interpretation. 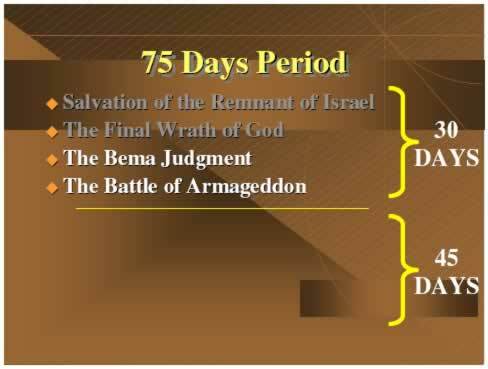 There are two periods mentioned in the book of Daniel that occur immediately after the end of Daniel's 70th Week. The 30 day portion can be classified as The Reclamation Period, and the 45 day portion can be called The Restoration Period. These names are chosen to clarify the things that will happen during each specific period. To understand the 30 day Reclamation Period, we must look back at what will happen at the mid-point of the 70th Week. The rapture is the great "catching away" of all those who have trusted Christ - living and dead. The word "rapture" is not found in scripture. It is from the Latin Vulgate (ancient Latin translation of the Bible) "rapere" which means to "catch up." In 1 Thess 4:17 the Bible states that we will be "caught up" and this is the phrase where the Vulgate used the word "rapere." 1 Thessalonians 4:15-18 is the definitive passage that describes the event we call the rapture. The fact that the saints will be raptured is clear in scripture and there has not been much debate on that fact. However, the timing of the rapture has been hotly debated for centuries. So, the question is, when will the rapture occur? 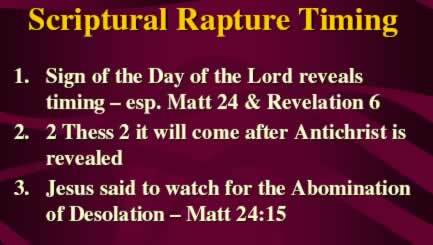 In our last session we talked about the event in scripture commonly called the rapture. 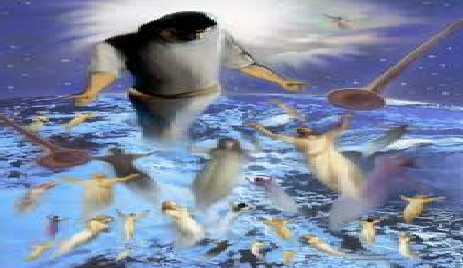 It is described in 1 Thessalonians 4:15-18 as being the event when all the saints of God, living and dead, will be gathered to meet Jesus in the air and be taken home to heaven. We discussed how the actual timing of the rapture has been debated for ages. There are three views that are the most prominent and we looked at each in detail. After analyzing each position, it became obvious that each view has its problems and none seem to fit all of scripture in a natural way. The whole purpose of this study is because I believe the answer is "YES!" 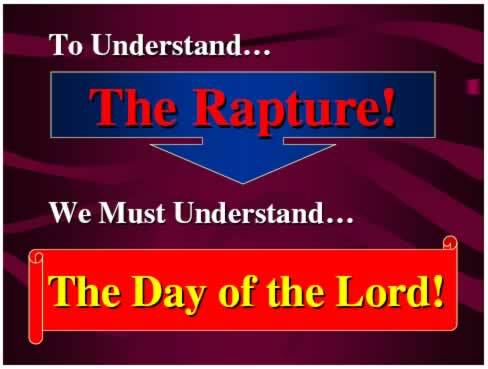 But, to understand the rapture and the issues surrounding the timing, we must first understand what the Bible teaches about the Day of the Lord. To understand the Day of the Lord, we must look at what the scripture teaches and discover what the Day of the Lord really is. 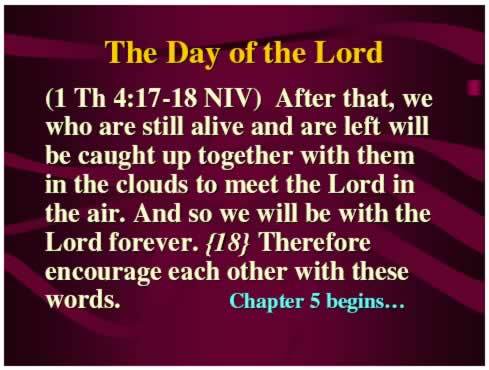 The last session dealing with the Day of the Lord, was significant in that it taught how the "Day of the Lord" and the rapture are connected. It taught that there are 3 themes which surround the Biblical teaching of the Day of the Lord - in the Old Testament, New Testament and in the book of Revelation. 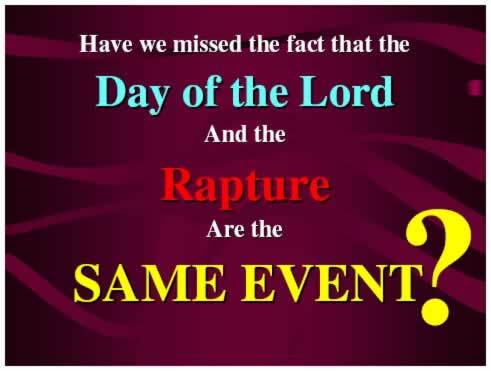 We found that in the Apostle Paul's teaching about the rapture, he called the event "The Day of the Lord." 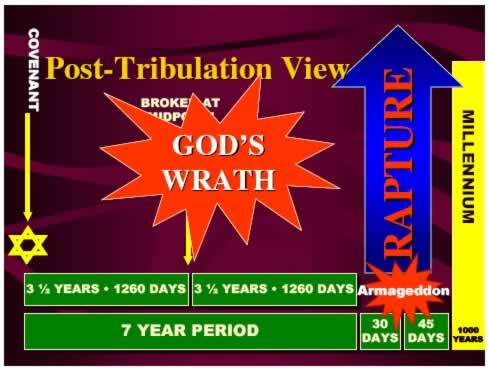 In the last session dealing with the Pre-Wrath view of the rapture, we looked at validating the Pre-Wrath view by harmonizing the prophecies concerning the end of time. The next task is to find if all the problems with the other views are answered by the Pre-Wrath view. 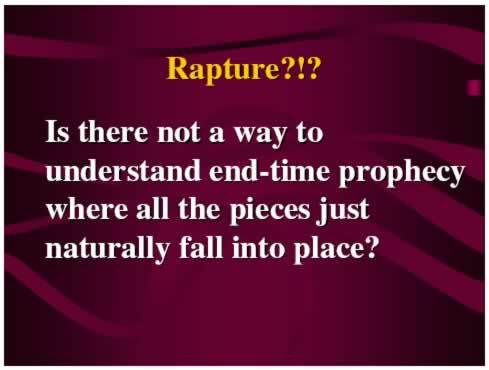 But to do this, we must first determine the timing of the rapture according to what the scripture says. 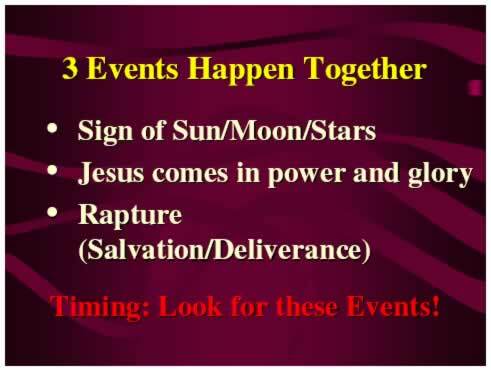 The Bible tells us that there are three events that will happen together at the Day of the Lord. So, in order to determine the timing, we must look for these events in prophecy and discern if there is harmony as to the time when these things will occur. The book of Revelation locates the sign of the Day of the Lord after the sixth seal is broken. Let us take a moment to discuss the theological perspective of this study. If you hear enthusiasm in this study - it is not arrogance to suggest that the pre-wrath view is correct and anyone who disagrees is wrong. On the contrary, the enthusiasm I feel in this study is because for the first time for me - the pre-wrath view allowed all the prophecies to naturally fit together, it gave me a truly scriptural perspective on the end of time, and it was a watershed issue that caused me to change my own theology - from what I had been taught to what I believe the scripture teaches. Could the pre-wrath view be wrong? Absolutely! I don't believe anyone has God totally figured out! We are trying to understand the infinite with our small finite minds. However, because of the harmony of the scriptures in the pre-wrath view - I feel closer to the truth than I have ever been. But you, the student of the scriptures, must decide for yourself what the scriptures teach. 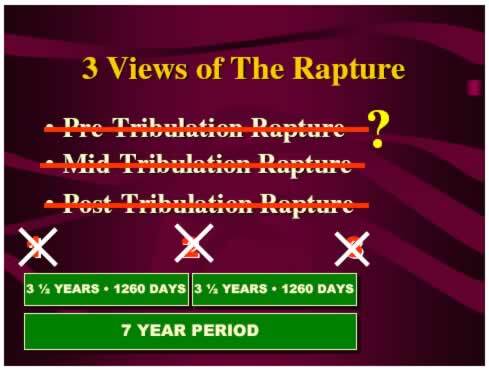 When we ended the last session, we decided that the rapture would occur sometime during the second 3½ years of Daniel's 70th Week (The Tribulation Period). 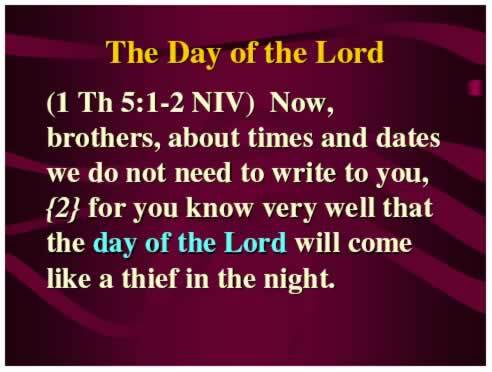 Jesus told us that no one knows the day and the hour except the Father. But, He said that we will be able to tell by the things that are happening that the time is near - "even at the door." Jesus gave us two clues dealing with the distress that would occur at the mid-point of the 70th Week when the Antichrist will demand the world worship him. 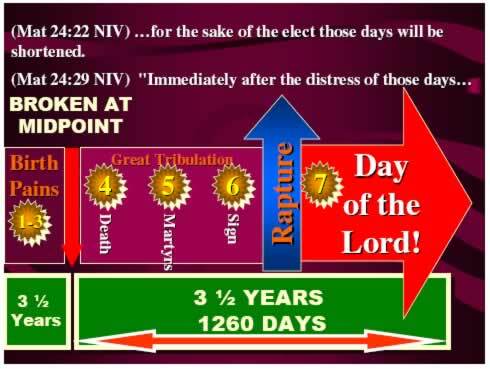 First, He said that the days will be shortened for the sake of the elect, and then He said that "immediately after the distress of those days" the rapture would occur. Now if the pre-wrath view is correct, then all the problems we encountered with the other views should be taken care of. 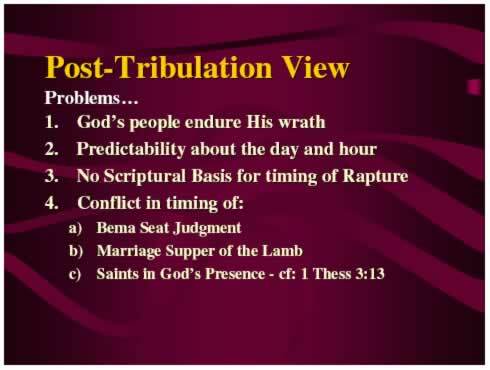 We saw that the post-tribulation and mid-tribulation views shared a common set of problems. We have seen that the seventh trumpet blows at the end of the 70th Week. At this point the saints have already been in heaven for at least a little time. Now the 30 day restoration period beings. These 30 days give God ample time to deal with the judgment of the saints. When must recognize that God is omni-present - which means He can be anywhere and everywhere at the same time. Therefore, He could judge each person all at once. 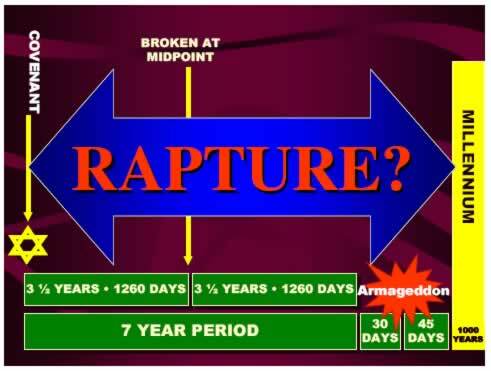 We have already seen that there are various scriptures that support a pre-wrath timing of the rapture. Matt 24:36 (NIV) No one knows about that day or hour, not even the angels in heaven, nor the Son, but only the Father. Matt 25:13 (NIV) Therefore keep watch, because you do not know the day or the hour. Matt 24:32 (NIV) Now learn this lesson from the fig tree: As soon as its twigs get tender and its leaves come out, you know that summer is near. 33 Even so, when you see all these things, you know that it is near, right at the door. The last session we will deal with depicts the events that will comprise God's wrath in the Day of the Lord. These events are foretold in the book of Revelation symbolized by the sounding of the seven trumpets and the pouring out of the seven bowls. 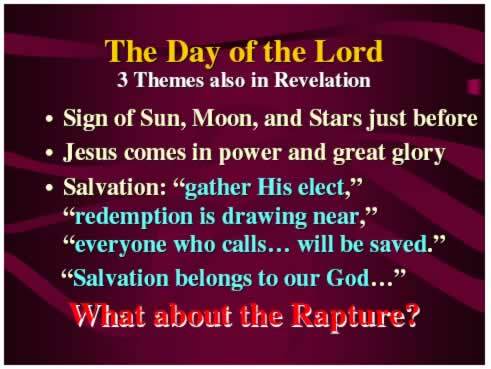 As we focus on the wrath of God, we will be narrowing in on the Day of the Lord that takes place as the saints of God are raptured from the earth to heaven. The division of the trumpets and bowls in the book of Revelation allow us to separate God's wrath into two parts that we will call the "beginning wrath" and the "final wrath." 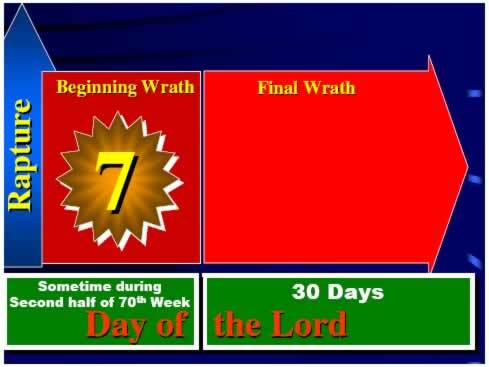 The wrath of God will begin as the seventh seal (Rev 8:1-6) on the scroll of "The Day of the Lord" is broken and the scroll is opened.